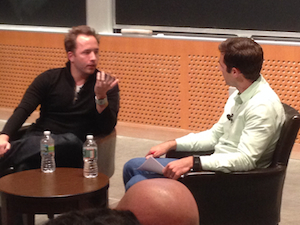 Sharing some audio from a talk that Dropbox founder Drew Houston gave at MIT last month. It was organized by the Dorm Room Fund, a new student-run venture capital entity in Boston. Houston, who graduated from MIT and gave the commencement address there earlier this year, was interviewed by Phin Barnes, a partner at First Round Capital who oversees Dorm Room Fund. On finding a co-founder: "It was actually kind of a nightmare." On how successful tech companies are built: "There's actually not a lot of magic. It's a lot of iteratively trying to make reasonable decisions, and get the smartest people you can around you." On the perennial debate about the best place to start a tech company: "You come to your own verdict. Obviously, there are good companies started all over the world, like Groupon in Chicago. ...Visiting and now living in the Bay Area was a really eye-opening experience. There's so much of an ecosystem, so much institutional knowledge of how to take a couple scruffy undergrads and shepherd them along to creating a billion-dollar company. That's just unmatched anywhere in the world." On what's next for Dropbox: "We're trying to build the home for your important stuff," and also reach one billion users. The audio is a little on the quiet side... you may find it helpful to listen with headphones. More: I was at the Y Combinator Demo Day in 2007 when Dropbox first pitched local investors...and I wrote about the company's early days last August.